Recently I've gotten back into art. Since January 2017 I determined to draw or paint at least one thing a day. One of my closest, and oldest, friends back in high school and college (I only graduated in 2015) would constantly tell me I was better at drawing than I gave myself credit for. I never believed her, but last year I began thinking- well, does it matter? I'm never going to improve if I don't practice. So I've been practicing. A lot. Almost every day. Left: The first attempt in a blank paper journal I bought earlier in the year. Watercolour pencil. 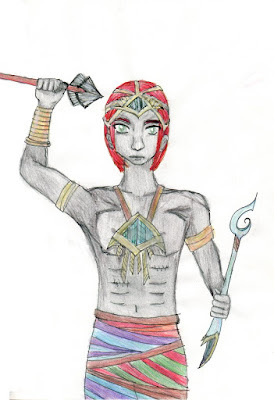 Lines are poor, but the colouring is better than anything I ever did before that. Right: Sketch from a couple months later, same journal, same media. It's not good, but you can see the massive improvement from the left-hand sketch. Note: Image links lead to a larger posting and description of the respective image. Returning to art was shocking. I hadn't worked on an actual art piece since high school, just doodles in my notes during college. Turns out, sneakily doodling the people and objects around me kept me practiced, and my basic drawing skills had improved significantly since high school. I hit a lazy point for a couple months, but then something shocking happened - Kelly, the friend who had encouraged me, died. She and her mom were hit by a drunk driver. Her mom died at the site, and Kelly passed two weeks later. This past Saturday I turned 25, one year older than she will ever turn. I threw myself back into an art frenzy and continued the writing frenzy I began that June, to honour her. She never doubted me in anything, even when I doubted myself. Hell, she's the one who replanted the idea of study abroad in my head! So where this began as simple stress relief from grad school, it's now a form of therapy and a way to honour her memory. Left: A quick painting with cheap watercolours, June 2017. Right: Same cheap watercolours, January 2018. I noticed they were opaque even on this different paper, and not super water-soluble. I remembered that from doing the sketch on the right. These convinved me to buy different watercolours. 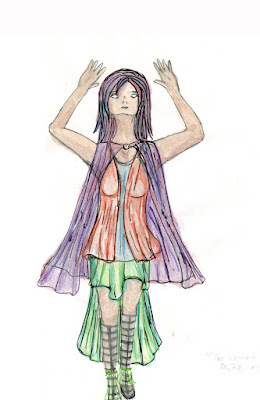 I haven't stopped drawing and writing since, and this year I even went back to watercolour and bought real watercolour supplies, like sable and squirrel blend brushes to compare to each other, and have been using the high quality synthetic brushes my mom gave me from her days back in college for fashion design. In January, someone from a journalling group on facebook even gave me some watercolour journals, which I've been using every day, sometimes more. 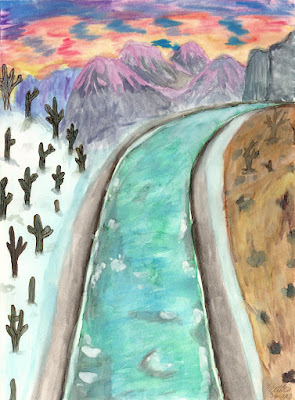 I've been homesick since last January, so there's a lot of desert and desert-influenced pieces, as well as my usual music-influenced pieces. Above: Set A is the same as the woman and the canal, other cheap set B. 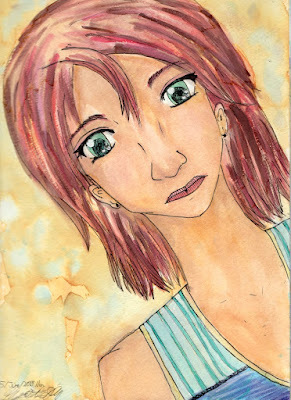 B is far more vibrant, translucent, and in general very watercolour-y. This was the last of terrible paper, so I knew I needed a new, proper watercolour sketchbook. 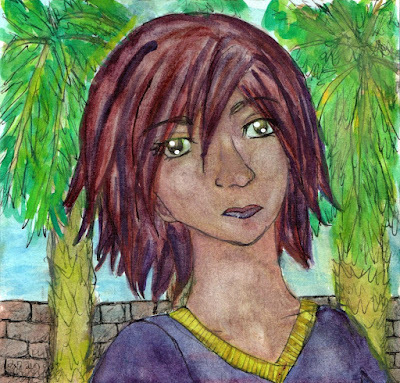 After many paintings with Watercolour Set B from set above including the one below with the girl in front of the palm trees, I decided I needed to properly learn watercolour. So I went and bought an artbook from Jo-Ann's. Took me a while to pick and finally picked out that, on flip through, looked the most informative and was actually trying to teach me watercolour (Beginning Watercolour by Maury Aaseng, if you're interested), some masking fluid, and went back home. After a bit more research and the wonder of finding Parka Blogs, which gave me detailed information on watercolor sets for beginners, watercolour sketchbooks, and also had video reviews for multiple watercolour and other media (I'd also recognized him from fountain pen videos I'd watched before). I work with pen and ink and do watercolour over the inked drawing, as does he, plus the way he writes and the way he films his YouTube videos works perfectly for me, and I've learned a lot. When it came to paper, I have a 9x12 inch Strathmore Visual Art Journal with 300 gsm watercolour paper I bought back in college and only had two paintings in, but I needed something a little smaller. Someone from a journalling group I belong to on Facebook was super kind and, when I asked for their personal recommendations on budget-friendly watercolour sketchbooks, one of them offered to send me two. She actually sent me three! Two watercolour, one mixed media that is okay for a single watercolour wash but excellent for watercolour pencil. 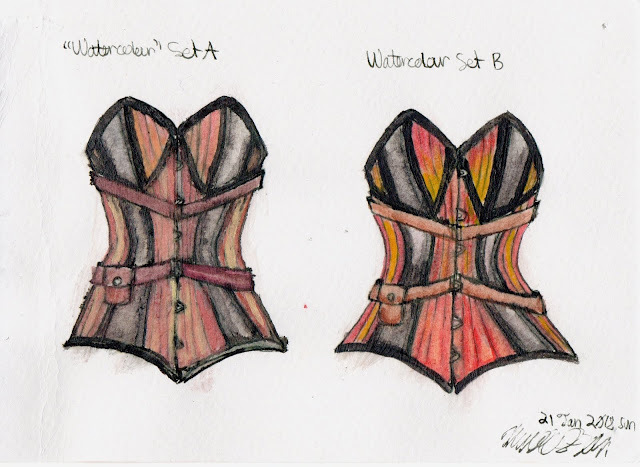 Right: Watercolour set B in a Stilman & Birn beta series sketchbook. I've learned much. I'm not good, but I've learned. The awkward light portions on the face, neck, and part of the shirt were scrubbed out after I learned about scrubbing out pigment, a couple weeks after I had actually painted this. 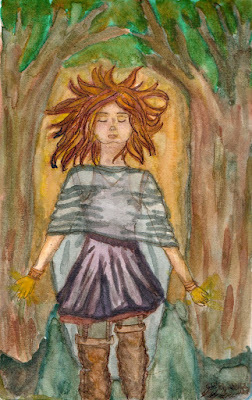 Now I saw that, if I was going to keep at this watercolour thing, I needed better watercolours. I kept doing my research on watercolour brands, and eventually bought a Sennelier La Petite Aquarrelle tube set. 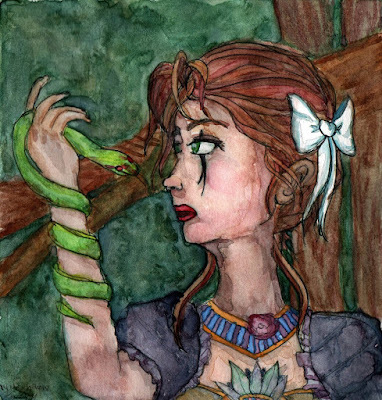 It's the student version of Sennelier, figuring that I did know I liked watercolour, but wasn't committed or had enough free time to warrant a full quality set in any brand. They came in just in time for me to pour the tubes into an empty tin and half-pans right before I went to New Orleans for a business trip. So, the first use for them was in my hotel room during a conference break. I immediately saw the different between them and any of the under $6 watercolours I had ever used in my life. Left: The first painting I did with the new watercolours, between conference breaks in my New Orleans hotel room, in a Pentallic Aqua Journal I got from that awesome and very kind person! Right: Similar intensity of pigment use in the same Stilman & Birn beta series sketchbook, from the same person, with the girl in front of the palm tree, with the Sennelier La Petite Aquarelle watercolours. Excusing my lack of skill, the difference is amazing to my eyes. So that's all for now. I haven't uploaded the last two images yet, but I will soon. And I'll endeavour to post more often here, especially since I'm still knitting and crochet designing! I haven't posted in a long time, so here's quickie. At the end of 2015 I was getting ready to move from Arizona to New Hampshire, and for whatever reason in those last two weeks of December, when all my stuff was packed and all, I decided to submit a frenzy of knitting designs to publications that had posted in the Ravelry designers board, and one designs submission to an indie dyer. The latter is how Infestation Cowl was designed to use just under a single skein of Knitting in France DK weight. I also had a design accepted by WEBS, which was fantastic! 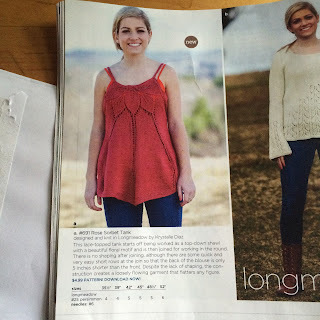 The design is Rose Sorbet Tank, which you can also view directly on WEBS. 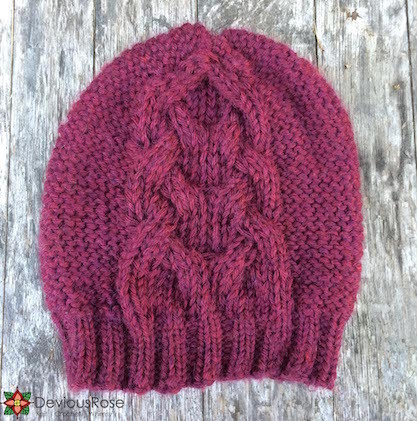 Rose Sorbet was a challenge to write up- sizing, the sample, a bit of short rows, the whole lot. It was my first go with tech editing and professionals looking at and examining my work. It was amazing to see it go up and get published, but that giddiness was nothing compared to when I finally saw it in the WEBS paper catalog. Just- wow! That felt good. 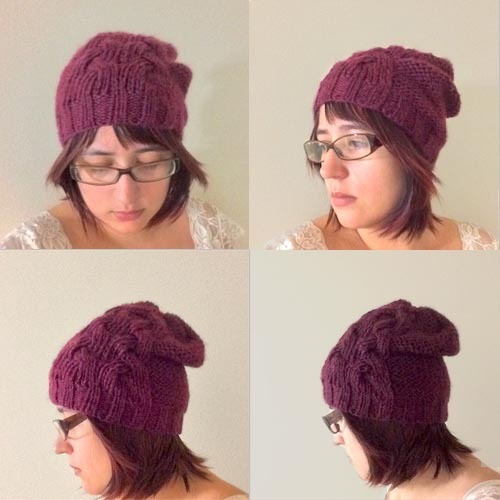 Then last year, I self-published design a lovely unisex hat with a bold cable. 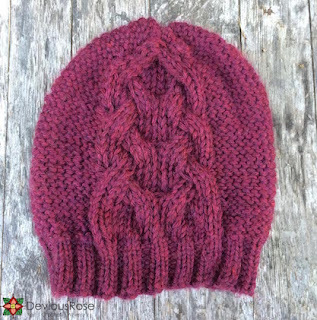 Bordeaux Cabled Hat comes with instructions for both a slouchy version and a classic, non-slouchy beanie. It comes in two sizes to fit 18-22 (22-26) in / 46-56 (56-66) cm head, which spans the average teenage to adult man and woman. It is currently in testing, and will be out by the start of autumn, just in time to make before the bitterest of the autumn and winter start to chug along. Bordeaux Cabled Hat can be worn with the cable at the center (Top 2 images of Figure 2) or off to the side (Bottom 2 images of Figure 2). 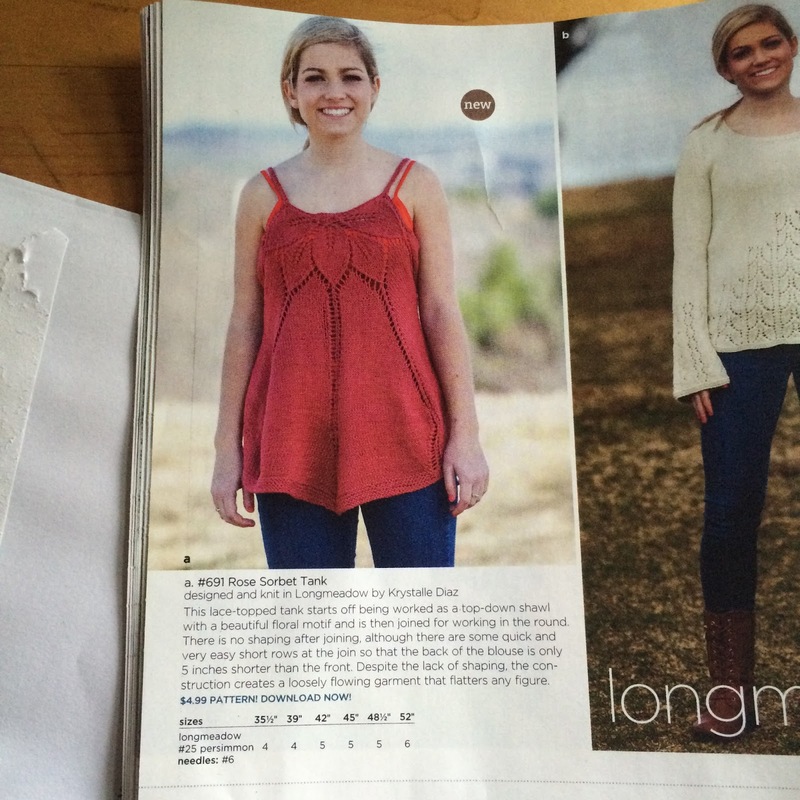 Pattern arrives mid-September. And upcoming is something in a periodical I loved back in high school. Yarn support came from the only yarn company I've ever bought from more than once, and I'm working on the sample now!